The Lunar Prospector mated to the Star 37 Trans Lunar Injection module. 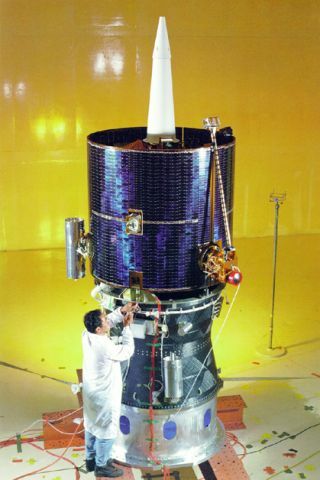 In this historic photo from the U.S. space agency, the fully assembled Lunar Prospector spacecraft is shown in January 1997, mated atop the Star 37 Trans Lunar Injection module. Lunar Prospector represented the first NASA spacecraft to revisit the Moon in 25 years. In December of 1972 Apollo 17 astronauts Gene Cernan and Harrison Schmitt were the last humans to set foot upon the Moon and the last NASA mission to visit the lunar frontier. On January 6, 1998 at 9:28 p.m., Lunar Prospector was launched from Cape Canaveral, Florida aboard a Lockheed Martin Athena II rocket. Also onboard were the ash remains of astrogeologist Eugene M. Shoemaker. A scientist from the U.S. Geological Survey, he was detailed to NASA and helped train Apollo astronauts in lunar geology. However, as co- founder of a "rogue string" of comet fragments, his name will forever be linked to the much hearlded Shoemaker-Levy 9 cometary impact of the planet Jupiter in 1995. Lunar Prospector mapped the Moon's elemental composition, gravity fields, magnetic fields and resources. Prospector provided insights into the origin and evolution of the Moon. One of the most significant finds by Lunar Prospector was confirmation that there could be as much as 10 billion tons of subsurface frozen water near the Moon's polar region. The Lunar Prospector mission came to a creative and daring conclusion when on July 31, 1999 at 2:52:00.8 a.m. PDT Mission Control Ames directed the spacecraft to a crash landing into a deep crater near the Moon's South pole. The hope was that the impact might release trapped water vapor. However no visible debris plume was detected by numerous observatories monitoring the event. This lack of direct evidence has not diminished the hope or belief that subsurface frozen water does exist.